One of the Facebook groups I belong to has asked people to share what they’ve stitched this year. I’ve stitched heaps and most of it will be going into “Smøyg: Pattern Darning from Norway”, so I’m not willing to show it all to you just yet. However, the biggest thing I’ve stitched this year was definitely my smøyg band sampler, which will be going into the book. I had so much fun stitching this sampler. There are 22 different bands. Each band is from old, historical embroideries from Norway. They come from different regions and different items of clothing which accounts for the wide variety of designs, styles and colours. If you think the sampler looks long, you’d be right. It’s about 1.2m in length or nearly 4 feet long. However, it’s only very narrow, so each band is very achievable. I found that if I didn’t particularly enjoy stitching a band, it didn’t really matter, because it would soon be finished and I could move on to the next one! I’ve stitched many other things this year, and am currently working on some class submissions. As always, designing and stitching new things is so enjoyable! For me, 2018 holds quite a bit of travel. I’ll be teaching on a cruise from Sydney to Seattle in April/May. Then in July, I’ll be heading to the ANZEG conference in Nelson, NZ to teach. And there are shorter trips to Melbourne and country NSW for classes. Of course, I’ll also be teaching locally at The Crewel Gobelin in Killara, Sydney. At some point in the year, I will travel to research for the next book – yes, the next one is already decided. In fact it was decided over a year ago, and no, I am not telling you what it is on yet! 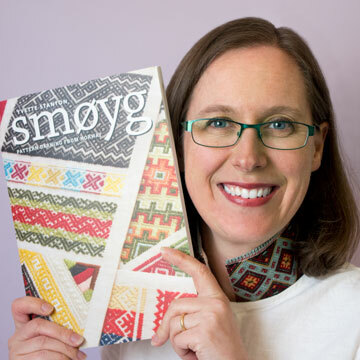 And at some point in the year, “Smøyg: Pattern Darning from Norway” will be published. I’m really looking forward to sharing that with you all. It’s an explosion of colour, and in what will be a relief to many, it isn’t actually a difficult technique! What have you enjoyed stitching this year? Did you achieve something special this year, like mastering a stitch, or finishing a big work? Or did you make a gift that was gratefully received? I’m not sure if you can attach photos in the comments section of my blog, but if you can, we’d love to share in the celebrations of your achievements. And what are your stitching plans for next year? Do you have specific goals for your embroidery? Whatever your stitching achievements and plans, whether they’re big or small, Happy New Year! Can I ask what fabric and thread are used for this colourful technique! My big effort for 2018 will be trying to finish a few ufos!! Thanks Julie. It’s linen fabric and mostly wool thread. Sometimes some silk though. Best wishes for 2018! That’s a truly beautiful sampler! So bright and vibrant. Happy new year for you. It sounds as though you’ve got a busy and exciting year ahead. For me, I’ll be finishing my RSN Certificate and all being well make a good start on the Diploma. But with major changes happening in 2018 I might not get as far as I hope. All the best for all that, Catherine. I hope you do accomplish as much as you set out to! I enjoyed meeting you too, Wendy! It looks like you’ve had a good embroidering year. I know you had a good quilting one also! What a lovely sampler. And what a year in prospect!